I am often asked how to find syslog commands on Huawei devices. As one is familiar with Cisco‘s devices, he is looking for “logging” command in Huawei’s VRP. And this is the main problem. Remember that equivalent of Cisco’s logging is info-center on Huawei. The information center functions as an information hub. 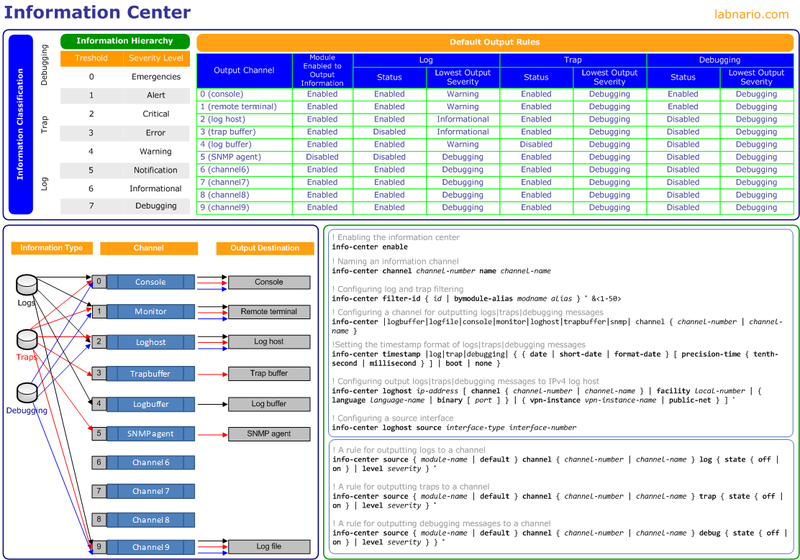 The information center manages most output information. Output information is classified and then effectively filtered. Together with debugging commands and the SNMP module, the information center provides powerful support for the network administrator to monitor the operation of devices and locate faults. Generally speaking, the information center distributes three types of information with eight severity levels to ten information channels, and then outputs that information in different directions.